Habit: Plant a series of +- erect shoots without rhizophores of +- determinate growth from rhizome; green aging tan then gray. Leaf: of main stems 1.5--2.7 mm, 0.4--0.6 mm wide, linear to narrowly lanceolate, not decurrent, base hairy on surface; awn 0.3--0.7 mm, +- rigid, toothed. Cone: 0.4--1.5 cm. Ecology: Open sites, mineral soil on rock outcrops, amid shrubs; Elevation: < 2000 m. Bioregional Distribution: s NW, s SN, SnJV, CW, SW, sw edge DMoj, DSon; Distribution Outside California: Baja California. 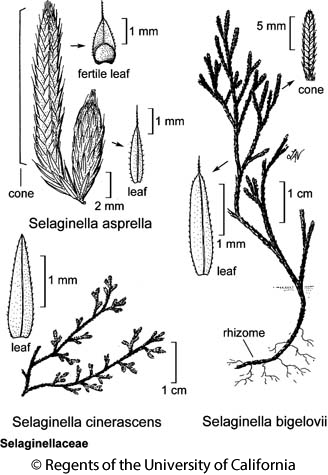 Citation for this treatment: Paul Wilson & Thomas J. Rosatti 2012, Selaginella bigelovii, in Jepson Flora Project (eds.) Jepson eFlora, http://ucjeps.berkeley.edu/eflora/eflora_display.php?tid=44043, accessed on April 19, 2019.
s NW, s SN, SnJV, CW, SW, sw edge DMoj, DSon; Markers link to CCH specimen records. Yellow markers indicate records that may provide evidence for eFlora range revision or may have georeferencing or identification issues. Purple markers indicate specimens collected from a garden, greenhouse, or other non-wild location.